Join Global Pet Expo and PetStorePro for a series of hosted events to help your pet store be more successful in 2019. 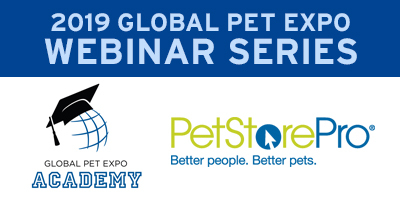 Featuring speakers that you will see at the 2019 Global Pet Expo Academy seminars in Orlando, March 20-22, these free webinars and other special events will bring you expert advice on all aspects of your business, including marketing, business development, inventory management, staff training and development, finance and visual merchandising. Kick off 2019 learning the best ways to meet more customers for your pet business and drive more sales and profits all year long! Creating Social Media Content That Connects With Your Pet Store Customers All Year Long! Invest an hour of your time on this webinar to learn tips, tools, and tactics your pet store needs to create dynamic social media content. You will see immediate pay back in content that engages, entertains and drives sales for your business! No matter what you sell and who you sell it to, using social media as a marketing tool can help grow your pet store sales and pad your wallet all year round. If you’re wondering, "Do I really need to use social media in 2019?" The answer is Yes. One Thousand Times YES. Attend this session and we’ll share the most critical lessons for 2019 social media marketing that can help you make social media a powerful marketing tool for your pet business all year long. In this webinar, you will learn how to: listen via your social media pages to develop a deeper understanding of your customers; create social media content that is a key element to your pet stores’ customer service routine; create authentic content on your social media pages that inspire emotions and action to/for your customers; and create content that consistently garners more likes, shares, and comments – and makes everybody happy! Join us for this informative session that can and will catapult your social media content to another level of engagement and sales in 2019! Lynn Switanowski is Founder and President of Creative Business Consulting Group, a Boston based Retail Consulting firm. With more than 29 years retail industry experience, CBCG partners with retailers and manufacturers to create and implement profit improving programs including inventory management, social media marketing and sales strategies. CBCG helps retail businesses of all size understand the business opportunities created by changing consumer trends and helps business owners harness the power of new media and marketing tools to connect with today’s “wired” consumers. Lynn is a favorite among Global Pet Expo speakers, and teaches retail marketing and branding at several colleges in the Boston area. Learn about the various added-value opportunities that attending Global Pet Expo can provide for your small business. Our presenter, Curt Jacques, will discuss the key ingredients to making your trip a recipe for success, with examples from his own experiences to help attendees maximize their investment. As a business owner, it can be difficult to justify the cost and, more importantly, the time away from your business. Curt will illustrate on multiple levels how, with adequate preparation and strategy, attendance at Global Pet Expo can become one of your most-effective tools for gaining buying power and competitive edge. After attending this webinar, you will likely be asking whether you can afford NOT to go to the show! Curt Jacques is the President/Owner of West Lebanon Feed & Supply (2013 Global Pet Retail Excellence Award Winner) and Retail Mechanics Business Consulting. With over 40 years of sales and marketing experience in the pet and animal industry, Curt is well versed in the world of retail/wholesale from numerous vantage points. Known in the industry as a forward-thinking entrepreneur who challenges the paradigm with his fresh, out-of-the-box approach, Curt has garnered attention from business leaders across the country and he has been repeatedly called upon to consult and assist other companies with their own business-development strategies. Nancy Hassel, founder and president of American Pet Professionals, has hosted and co-hosted over 600 pet industry events. In this webinar she will share step-by-step ways to create, plan, promote and host a successful pet event. Learn how to ensure your pet event and business will stand out from the crowd and be the "go-to" place for festive, fun, unique and educational pet events. See how successful pet events help draw in new customers, garner media attention, create community and form lifelong camaraderie among your pet pro peers. Hear tips on how pet events are also an amazing way to cross promote other businesses in your location. About the Presenter: Nancy Hassel co-founded the American Pet Professionals, an award-winning business networking, educational and multimedia organization for the pet industry in 2009. She has lead over 100 in-person educational networking events, seminars, fundraisers and online events for pet industry professionals. A Public Relations specialist for the pet industry, Nancy works with pet companies in many aspects of PR, event planning, media relations and training. Nancy co-hosts the boutique B2B trade-show, NYC Re-Tails & Sales Pet Expo with Dana Humphrey every spring. She is a speaker at various pet industry conferences, a writer for pet trade and consumer magazines, blogger, avid photographer, and was a TV producer and production coordinator for 10+ years. Nancy created a Responsible Dog Ownership program and taught over 2,500 pet parents in a 5-year period. Recently awarded the 2018 Women of Influence by Pet Age Magazine and her organization was voted Best Networking organization three years in a row by LI Press newspaper. Just like your mother told you "Words matter,” in life - AND for your social media posts for your pet business! Join us for this webinar and learn what words can do to help you make your social media posts more impactful and get people talking - and buying on a regular basis! Attendees will walk away with a step-by-step plan that helps identify how to connect with your customers (no matter what generation they are from) using words that help your pet business to create customers who are brand evangelists and that will help you sell the products and services - your business offers. About Your Presenter: Lynn Switanowski-Barrett is the Founder and President of Creative Business Consulting Group, (CBCG) a Boston, MA based Retail Strategy Consulting firm. Using more than 29 years retail experience as her guide, Lynn leads the CBCG team to engage with retailers, e-trailers and manufacturers helping them create and implement profit improving sales, marketing and inventory management strategies. CBCG helps retailers understand how to build, grow and sustain their businesses by harnessing opportunities created. Where’s Waldo? Recruit Top Talent Today! Recruiting has to be more than just filling a vacant position – and retaining top talent is all about making the right selection to begin with. Managers need to look at the scope of the role – and how that may have changed since the last person held the position. What do they really need in the future… and how can succession planning be impacted by hiring just the right person. Candidates look for jobs in a new way, and the tools available to managers to screen candidates should be utilized. Technology can be a huge time saver in communicating with and evaluating candidates. Tools in background evaluation and personality assessment will be reviewed to help managers determine which are appropriate to bring into their recruiting process. We will provide participants with recommendations to determine starting salary and the proper preparation of the offer letter. Finally, our discussion will conclude with the tools to identify top talent and ensure they are aligned with the long-term success of your organization. Lori Kleiman has more than 25 years of experience advising companies on HR issues. She has deep experience working in family business, creating an entrepreneurial venture and running a division of a fortune 500 organization. Lori founded a boutique HR consulting firm acquired by Arthur J. Gallagher & Co. in 2007. Lori continued with Gallagher to lead the HR consulting practice until 2013, until she left for her next venture, HR Topics. HR topics bring HR to small business in a way that is relevant, actionable and manageable. Lori has a master’s degree in human resources, is SPHR and SHRM-SCP certified and a member of the National Speakers Association. The A.C.E Model: 8 Steps to Creating an Astonishing Customer Experience! We hear the following words to describe stores like awesome, beautiful and great but wouldn’t you like to hear that your customers find you downright “astonishing”? To have that word be one your customers use, we’ll focus on 8 critical areas of your store that EACH need to make your customer “gasp”! New research reveals that “To see, touch, feel and try out items” is the top reason why consumers choose to shop in physical stores versus online. With 62% of shoppers wanting to kick the tires, retailers must take full advantage and up their game to create compelling in-store shopping experiences. Your store’s grading scale includes marketing, exterior and interior, employees and 4 more that you might not have thought of. Get your pencils ready to score yourself on each area and learn how to deliver that “astonishing experience” for each of your customers! Discover how to multiply your “unique brand” through first impressions by the important interior and exterior experiences. Uncover the marketing connections you must maintain to multiply the strongest customer relationships. Decide what three sales techniques your staff must master to see sales really multiply. Realize the most important “step” your customers may secretly want but never tell you. As a customer service strategist, Anne works with companies to develop and deliver innovative ways to keep customers coming back and spreading the word about their service experience every step of the way. Anne believes that customer service isn’t about the transaction, its’ about transforming customer relationships into a contagious experience ….worth spreading. Her interactive keynotes and workshops help challenge leaders, create more effective sales teams and improve performance at each and every customer service touchpoint. Anne works with small to mid-sized businesses and professional associations. With the increasing importance of Social Media as a marketing tool for every pet business, the question becomes, how can you set up a replicable strategy that best utilize the SM platforms to connect with customers every single day? Attend our inaugural 2018 Global Pet Expo Academy/Pet Store Pro Webinar session and learn HOW to determine where your customers are getting information on social media about pet brands you carry and how they are engaging with those businesses every single day. You will learn how to use the tools to set up your own targeted marketing campaigns via social media and reach YOUR pet business customers more effectively in 2018 and beyond. Lynn Switanowski-Barrett is the Founder and President of Creative Business Consulting Group, (CBCG) a Boston, MA based Retail Strategy Consulting firm. Using more than 29 years retail experience as her guide, Lynn leads the CBCG team to engage with retailers, e-trailers and manufacturers helping them create and implement profit improving sales, marketing and inventory management strategies. CBCG helps retailers understand how to build, grow and sustain their businesses by harnessing opportunities created by changing business economics and evolving consumer trends. Lynn and the CBCG team help business owners learn to harness the power of technology to connect with today’s consumers and make more money while doing so.